I was aware of #1, but not #2 until I planned a team event last week to welcome some team members to the US. For Lam, this is his 5th trip to the US, but for Dung, this was his 1st. I'm going to do my best to make their stay as memorable as possible. At bowling we split into 3 teams. 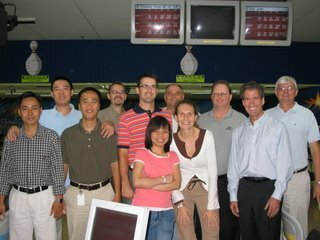 The Business Analysts formed their own team and, surprise of all surprises, they analyzed every detail (i.e., they play really slowly). In contrast, it seemed at times as if the other two teams were in a contest to see who could play the most games and drink the most beer. Even though I'm not playing against my brother and sisters, I'm still ultra competitive. I'm sure that is not a shock to anyone. The ball is heavier than Hien. Two hours of bowling should be the max permitted by law. After bowling, some of us went to Harpo's for karaoke. This is a local joint that gets crowded on Wed nights and is very close to the hotel (i.e, I can stumble home from there safely). Dung is my new hero. He got on the list of singers immediately. No fear whatsoever. In fact, he got up there twice, in front of a huge crowd of strangers. Way to go Dung! Aysem did a terrific rendition of "Stand By Me." She claims it was her first attempt at karaoke, but I don't believe her. She was too good. Please tell me you aren't taking up an interest in karaoke as well?!? If your singing voice is anything like your brother's, I would strongly advise against it! P.S. And thanks for adding me to the VIP list!